The animals we attract in our lives reflect us in many ways. Our connections with them run deeply, down to the soul level. Just like us, they are also on a journey to evolve their soul through their relationships and experiences, and each has deeply spiritual messages for us and intentions for our personal growth. 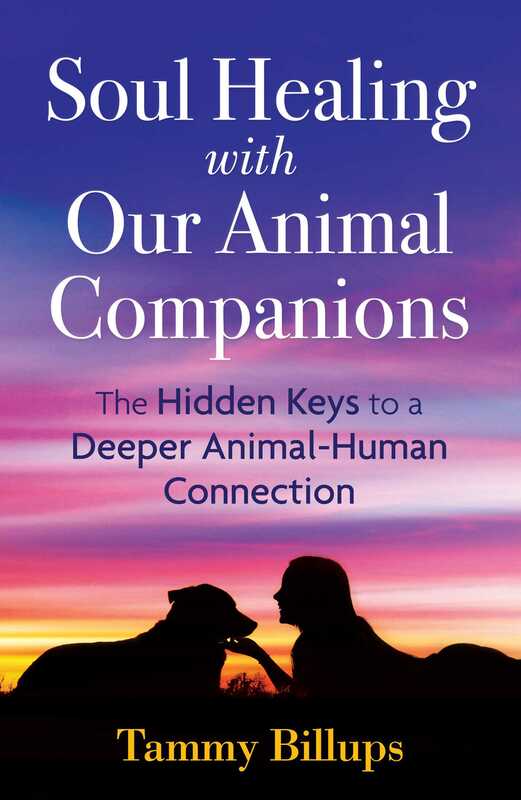 In this book, Tammy Billups invites you to explore and deepen this profound relationship, showing how you can co-evolve along with your animal companions, experience unconditional love, and, ultimately, enact healing for both animal and caregiver. Offering a soulful and bioenergetic perspective on decoding our animals’ actions, behaviors, and physical issues, Billups explains how our animal companions share our energetic patterns and emotional wounds, revealing issues in our own lives that may be hidden or suppressed. She identifies the five core emotional wounds in animals and the ways in which they manifest, outlining specific behavioral traits and physical issues animals may exhibit as they mirror our emotional states. She explains how to connect with them on a profound level so we can grasp their needs more clearly and learn what they have to teach us. She also provides guidance to help your animals heal the emotional wounds and traumas that create their anxiety, stress behaviors, aggression, and fears. The author details a three-step process to help you through decisions you will make on your pets’ behalf and explains how, when a person works on healing a core emotional issue in their life--abandonment for example--it helps the animal release this same issue and the corresponding negative behaviors as well. She also shows how extremely receptive animals are to energy work, holistic healing, and spiritual practices, explaining how these methods unlock emotional barriers and enable both person and animal to heal and reach their highest potential in conscious evolution. Providing tools to identify our animals’ messages more quickly, the author shows how our pets’ higher purpose is to help people understand themselves. One of the most--if not the most--fascinating discoveries I had when I first began working with animals was identifying that they hold the same core emotional wounds as people, in addition to having the same cloaks of protection. So what does that mean, you ask? Depending on your animals’ past experiences and the physical and emotional wounds birthed from them, they could have an unhealed emotional wound that created a feeling of either abandonment, betrayal, terror (unsafe), invasiveness, or of being detached from their core authentic self. These core wounds can develop from birth trauma, lack of nurturing from its birth mother, not getting its needs met, physical traumas, or abuse. Even something that happened that might be perceived as small can deeply affect how your animal develops and experiences life. The emotional wounds are held safely under a cloak of protection until the animal feels safe enough to release the perceived pain and negative feelings associated with it. Because emotions are held in the energy field, I see these cloaks as energetic patterns. At the time the original wound was created, the emotional pain was intentionally pushed down and covered up to safeguard against ever feeling the emotions birthed from the experience and, in a way, to pretend that it never happened. It is much like burying unpleasant feelings in the ground and hoping they will never rise to the surface again. But every emotion, positive and negative, is filled with life energy, so it will always be reaching for the light so it can be free. Covering up emotional wounds is an unconscious action that animals and people do out of a need to protect themselves and disassociate from ever looking at that moment in time. It could be seen as ingenious at its conception, but if the animal is unable to release the cloak as it matures, it will undoubtedly show up as unfounded or exaggerated fears, aggression, detachment, dependence, negative, and/or neurotic behaviors, or even physical manifestations. The cloak was beautiful at its inception, but over time, it begins to get dingy and gray, because it is also concealing their most authentic self and preventing them from experiencing a more peaceful and loving life. From a bioenergetics standpoint, the cloaks of protection unfortunately create energy pathways that your animal’s psyche travels time and time again, repeating the same painful pattern which then triggers the same chemical responses of fear and anxiety. These responses then become habitual and a feeling of normalcy can even ensue when the same situation presents itself. It is all choreographed and designed to protect the animal from feeling the pain of the original wound. Think about the rescue animal that has been rehomed and yet returned time and time again or an animal that is triggered into aggressive behavior in repetitive similar situations. When the animal is able to heal and release the negative feelings stemming from the original wound, she then feels safe enough to allow her authentic self to shine through. There are predictable characteristics and potential behaviors that go simultaneously with each specific unhealed emotional wound in your animals, making it easier to identify which core wound they are protecting. Here’sthe big insight about your relationship with your animal: You will call into your life and be attracted to an animal that has the same emotional core wound(s) as you. It’s impossible for this to not happen. You will be drawn to each other like magnets. Though how the hidden wounds show up in both of your lives might differ, there will be undeniable similarities. If you didn’t get your needs met when you were young, you’ll end up with an animal that didn’t either. If you have experienced invasiveness of someone doing something to you against your will in your background, your animal will mirror that as well. The good news is that animals are not as attached to their emotional scars as people. I’ve found that they can clear the effects of the original wound much more quickly than people. They are more trusting of the energetic healing process as a natural one and are not as attached to holding onto their cloaks of protection because they live more from the right side of their brain. Details of each emotional wound and the repercussions of the cloak to protect it will be explained in further detail below to help you gain the knowledge that will allow you to enhance their quality of life in the short and long run, in addition to giving you an opportunity to have more love, compassion, and patience for yourself and your animal companion as you evolve together. Animals will usually have more than one unhealed core emotional wound, just like people, so they are creating experiences at a soul level to help them to simultaneously heal several. When you read through the five descriptive types, know that your animal will rarely exhibit 100 percent of the behaviors from any one cloak of protection pattern. Out of the five, they will typically use one or two more than they use the others. This frequently used cloak of protection is concealing the unhealed wound of abandonment, which happens often to animals and can affect them all differently. Think of the dog that chases the tennis ball until he can hardly walk or the cat that will eat as if it will never have food again. They are always seeking to be filled externally because they weren’t allowed to experience the feeling of fullness and knowing when they’ve had enough. The same insatiable need to be filled is also happening at an energetic level. They are feeding on your energy in an endless battle to feel full because they don’t know how to fill themselves energetically and retain it. – Gigi Graves, founder and executive director of Our Pal’s Place, Inc.
"Billups, founder of the Sundance Healing Center, presents practical advice on how to develop a deeper connection with pets in this cheerful book. Written in uncomplicated, inspiring language, Billups’s fun book will be appreciated by pet owners with a spiritual bent."